This model is discontinued. 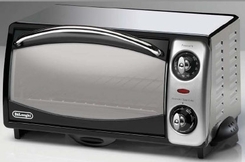 Click here to see other DeLonghi Convection and Toaster Ovens. 4-SLICE TOAST CAPACITY Now you can make enough toast for the whole family ûall at the same time. NON-STICK INTERIOR Makes cleanup quick and effortless. BAKE, BROIL, TOAST, OR KEEP FOODS WARM This is the ideal multi-function family oven. Multiple cooking settings with adjustable temperature control let you prepare food simply and conveniently. ACCESSORIES INCLUDED Cookie sheet, muffin pan, broil rack and non-stick bake pan. DROP DOWN CRUMB TRAY Lets you easily dispose of crumbs and other food particles. SLEEK, ATTRACTIVE RETRO DESIGN Complements any kitchen decor.